A special day for Muttville Senior Dog Rescue, July 1, 2012, will go down in Muttville history for a once homeless senior dog named Timmy. A week ago he was an abandoned stray. Last Sunday, he became a star! The chosen, long haired mutt now had a special advocate helping him find a new home... SF Giants star pitcher, Tim Lincecum!I was truly honored to be one of the four Muttville representatives to meet two-time Cy Young award winner Tim Lincecum. He was a genuine, down-to-earth, animal loving gentleman that won our hearts. And we believe Muttville's senior dog cause won Tim's heart. 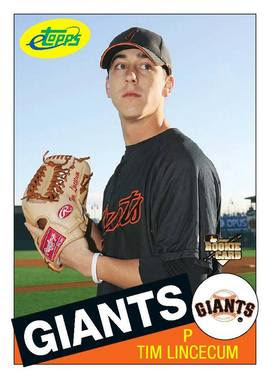 I created three items for this special day: a unique Timmy baseball card (shown above), reminiscent of one of Tim Lincecum's Topps cards ; a 40-sec video that was played on the Giants jumbo screen(! ); and a Limited Edition Muttville baseball tee in Giants colors (shown below) worn by our proud Muttville volunteers. We gave one to Tim, too. I hope he wears it! !